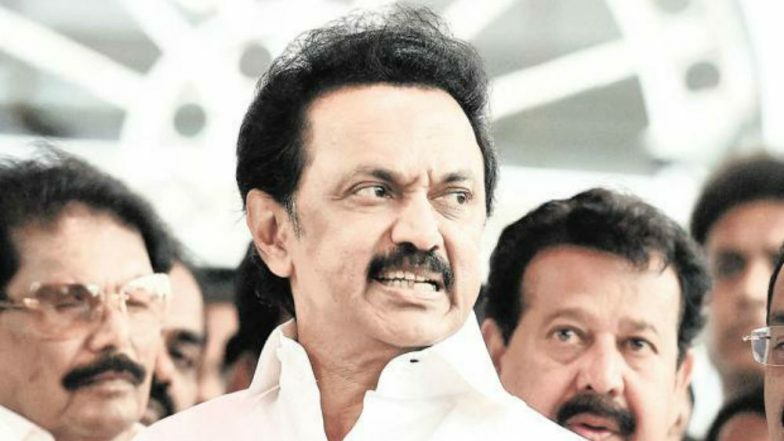 Chennai, March 19: The DMK on Tuesday released its manifesto for Lok Sabha Elections 2019. In its manifesto, the party said that it would ban the NEET exam if it wins Lok Sabha seats in the state. The DMK also promised to release the murderers of former prime minister Rajiv Gandhi. In the manifesto, Tamil Nadu’s opposition party also said that it would give citizenship to Sri-Lankan refugees. It also promised to give full statehood to Puducherry. Tamil Nadu Lok Sabha Elections 2019 Dates: Constituency-Wise Complete Schedule Of Voting And Results For General Elections. The DMK is contesting these Lok Sabha elections in alliance with the Congress. The DMK will field its candidates on 20 seats out of 39, while the Congress will contest on the remaining seats. In 2014 elections, MK Stalin led party fought on 34 seats. The DMK has also fielded 18 candidates for by-polls in Tamil Nadu which are to be conducted along with the general elections. AIADMK Seals Alliance With BJP, PMK in Tamil Nadu For Lok Sabha Elections 2019. Tamil Nadu is going for polls in a single phase on April 11. The election dates were announced by the Election Commission chief - Sunil Arora (Chief EC) on March 10. The Lok Sabha polls will be conducted in seven phases between April 11 and May 19. The results will be declared on May 23. Lok Sabha Elections 2019: Captain Vijayakanth's DMDK Joins AIADMK-BJP Alliance in Tamil Nadu, Gets Four Seats. In the previous Lok Sabha elections in 2014, the AIADMK led by late J Jayalalithaa won an overwhelming 37 seats out of 39 in the state. The BJP led NDA could manage only two seats, with the BJP and the Pattali Makkal Katchi winning one seat each. The Congress and the DMK could not even open their accounts.